The Burley Fires Environ 4247 Flueless Gas Fire is the perfect solution for those wishing for a contemporary inset gas fire but without the luxury of an external wall or an existing chimney or flue. The catalytic flueless technology that is becoming increasingly popular in the UK thanks to 100% efficiency and low running costs only emits Carbon Dioxide and Water Vapour, eliminating the need for a flue. Catalytic style fires are the fastest selling type in Japan and are popular all over the world and due to their high safety specifications are the only type of fire used in several US states and Austrailia. The Burley Fires Environ 4247 puts all this modern technology into a into a modern contemporary inset style with a brushed steel frame and pebble fuel effect, A choice of either black or cream fireback and optional remote control are also available allowing the traditional fireplace with surround and mantle to still feature in the modern living room without the need for to build a costly chimney or knock through an outside wall for a balanced flue fire and the 2.5kW heat rating means that this fire is not just for decoration but also provides heat to take the cold edge off a room. The modern contemporary brushed steel finish would look great with the Europa Washington Wooden Fireplace Surround with the black granite back and hearth contrasting with the brushed steel frame and highlighting the fire in the centre while the Natural Oak finish frames the fire nicely to create a contemporary yet traditional effect focal point in the living room. The Glass Fronted Studio 22 balanced flue gas fire is unlike most hole in the wall gas fires that utilise the popular "letterbox" format, the Gazco Studio 22 Bauhaus is a vertical fire and creates a focal point for any modern contemporary interior. 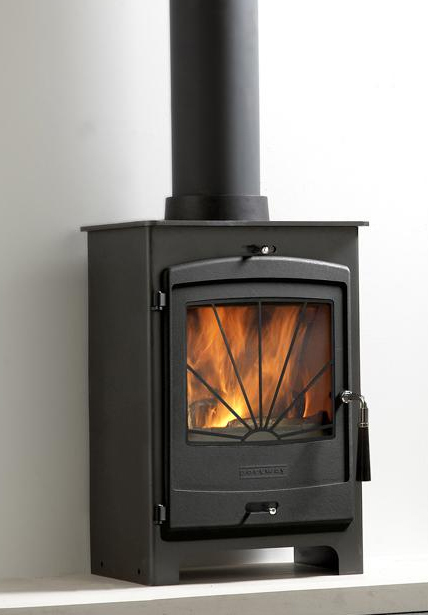 Set behind an almost invisible glass window, it features a highly realistic, log-effect fuel bed with a heat-retaining lining which adds to the fire's overall performance of 5.85Kw. All functions are controlled by the Sequential remote control, allowing you to operate everything from ignition to heat output at the push of a button. There is also a Touch Control panel which can be located up to 2500mm away from the fire, this can either be full inset into the wall or surface mounted. The Gazco Studio 22 Bauhaus features a classic tapered frame in either antracite or polished stainless steel depending on where the fire is going to be situated. If the fire was giong to be situated inset into a light or neutral coloured wall then the antracite finish would contrast and draw attention to the fire and highlight the log fuel effect and dancing flames against a light back that projects the warmth and glow out into the room. To situate the fire on a darker wall, e.g. a highlighted false chimney breast or focal wall then the polished stainless steel would add a definate frame to the fire and draw all the attention to the fire. "Adding vertical definition to contemporary styling"
There are several methods to provide heat from an electric source; they are Convector heaters, Fan Heaters and Oil Filled Radiators. These items provide heat into the room up to a maximum of 2.4kW (2400watts). They work by having a heating element, which is a piece of metal wire which heats up due to electrical current, this in turn heats up a proportion of air within the product. As this air heats up and expands it rises through the product and creates a draw (suction) in through the grills at the base, allowing cold air to be pulled up through the heating element and into the cavity of the fire to be heated. This then starts a cycle which will eventually provide a circle of air around the room until the fire cuts of as the air temperature within the room has hit the limit on the thermostat (Not available on all Products just look for Thermostatically controlled) These items are 100% Efficient, much like the Tesy Wall Mounted Panel Convector Heater CN01 240 shown opposite. As well as convector radiators the are also many Hang on the Wall Electric fires which are also Convector fires, they work in the same way but have a more aesthetic look to the design so they appear to be a wall fireplace instead of a very clinical panel heater. Much like theBemodern Dante Hang on the Wall Curved Glass Fire. Most people presume that placing a piece of ceramic glass in front of a fire would decrease its efficiency but as we’ve seen it’s the draw that causes heat to be sucked out of the room. High efficient gas fires not only have a glass front, but also a convector box. This is a channel which goes from the front base of the fire to the front top of the fire, wrapping the engine of the fire, this channel will allow cold air to enter underneath the fire and heat-up as it rises around the burner. This then leaves the fire as convected warm air through the convector grill. You also have the glass front which means that the glass holds the heat within the fire box for longer allowing it to escape into the room through the convector channel finally the Glass although ceramic heat proof does allow the radiant heat from the warmed up ceramics to heat also (This is the type of heat you get from a red glow, [infra-red heat]). From a Glass Fronted High Efficiency Gas Fire you can get efficiencies’ of up to 89% meaning wastage is cut right down to only 11% rather than the 70% seen on Open Fronted fires. A specialist in High Efficiency fires is Apex Fires google them!